Over the past few months, Berkeley has been home to some significant moments in dance history. First came Anna Halprin’s final restaging of “Parades and Changes” at BAM/PFA and this past Friday evening was Trisha Brown Dance Company’s one-night engagement at Cal Performances. A once-in-a-lifetime experience, this single performance was the final time that the Bay Area will see any new dances from this post-modern pioneer. Brown, one of the more famous graduates of the Judson Dance Theater, has decided to hang up her choreographic hat. The company will live on with a collaborative leadership team (Brown as Founding Artistic Director; Carolyn Lucas and Diane Madden as Associate Artistic Directors) but Brown will not be creating any new pieces. And so with this program – “Les Yeux et l’âme” (2011), “Newark (Niweweorce)” (1987) and “I’m going to toss my arms-if you catch them they’re yours” (2011) - two of her final works were unveiled to the Berkeley audience. The Bay Area premiere of 2011’s “Les Yeux et l’âme” was by far the highlight of the evening; a thorough examination of merging, intertwining and meshing. A polyphonic symphony for the senses, every element was introduced with its own independent purpose and equal validity: the abstract backdrop, the Baroque-style music and of course, the modern choreography. Then, these ideas and aspects were juxtaposed against each other, which led to a bold, rich and elegant interdependence. The movement was very dance-y (quite different from Brown’s early Judson days); fluid and organic; expansive and stately. With a cast of eight, partnering took on a major role, but the pas de deuxs weren’t about creating pictures, improving balance or facilitating the impossible. Instead, Brown used these duets to see what can organically arise when two bodies are threaded together in space. Solid grey unitards, primary-colored moving scrims and deliberate, mechanical choreography combined together for Brown’s “Newark (Niweweorce)”. This 1987 composition required intense focus, utmost concentration and incredible spatial awareness, especially from the two male soloists. Through much of the dance, they were engaged in a long unison sequence, despite the fact that they could rarely see each other and did not have many sound cues to rely upon. It was really quite a feat that these two dancers managed to stay completely in sync under such difficult circumstances and with Brown’s challenging choreography (my favorite movement being the side tilt that led into an airplane turn). But overshadowing the whole piece was an annoying soundscore of varying alarm blasts; some short, some long. I think it’s fair to say that if “Les Yeux et l’âme was a symphony for the senses, “Newark (Niweweorce)” was definitely an assault on them, or at least the auditory ones. Closing the program was the West Coast premiere of Brown’s “I’m going to toss my arms-if you catch them they’re yours” from 2011. The opening visual was really gorgeous – a bare-bones stage, no wings, a collection of large whirling fans upstage left, and the fully assembled cast dressed in billowy white. Immediately, the dancers began their first choreographic sequence amidst these fans: a slow, careful meditative practice, that had an almost angelic quality (which I’m sure was informed by the flowing white costumes). As the piece progressed, the dancers moved away from the fans and began to shed their outer layer, proceeding through the choreography in various forms of undress. And by the end, the women were in simple leotards and the men, boxer briefs. Was “I’m going to toss my arms-if you catch them they’re yours” about breaking free from constraint? Exposing vulnerability? Was Brown commenting on being stripped down and completely deconstructed? Or perhaps it was none of those ideas and was just a lengthy abstract work. Days later, I’m still a little unsure. Change is inevitable; time marches on and the artistic landscape evolves. 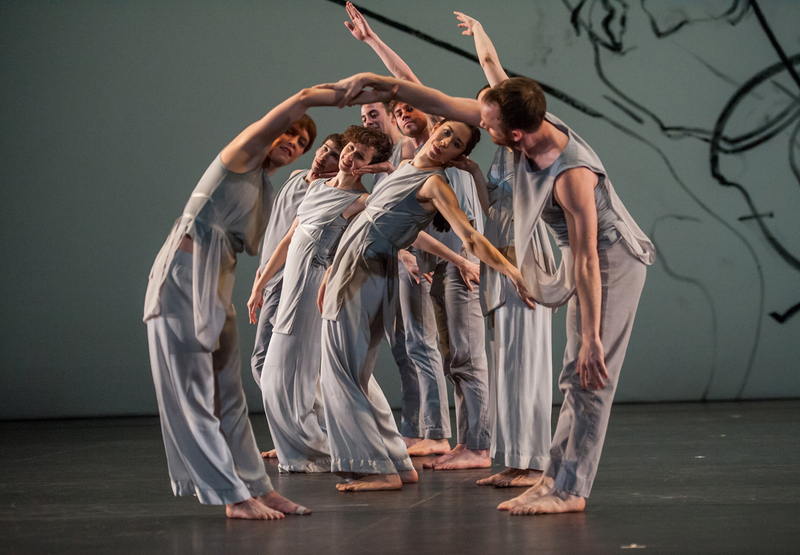 Trisha Brown Dance Company understands this truth and is committed to valuing both the past and the future. In the years to come, there will be new dances by different choreographers but Brown’s legacy and work will always be a part of the canvas.